Download | In the USA, the pellet production to export has reached 5 Million tons in the last years providing positive socio-economic impacts in the regions but also some socio-economic issues that need to be further improved. The main aim of this report was to understand the dynamics between local development and forestry activities related to the production and export of pellets on local communities. The forest sector in the USA shows few signs of development vector. Income increases slowly, but steadily in the United States, but the forest sector does not follow this same path. Job creation was clearly affected between 2000 and 2010 in the USA in the feedstock production and with no signs of general improvement between 2010 and 2014, but improvements are seen in the transformation sector. This could provide better opportunities for the expansion and adaptation of the pellet sector. Download| The report focuses on trans boundary shipment flows of solid biomass waste, particularly wood waste (hazardous and non-hazardous), in the north-western part of Europe in the years 2010-2016. Non-hazardous wood waste is a rather cheap fuel in comparison to other solid biomass resources and hence is used in some countries for bioenergy production on a significant scale. Also, large amounts of hazardous wood waste are traded, but an overview of these trade flows is so far lacking in literature. An analysis of its trans boundary shipment can be helpful for the national plans of the countries involved as well as the industries and organizations. Next to the valorisation as material, wood waste is being used for producing energy in modern bioenergy plants in Germany, The Netherlands and Sweden. The main importers of both hazardous and non-hazardous wood waste are Germany and Sweden with a yearly import of 600+ kilotonnes (KT). The main exporters of non-hazardous wood waste are UK, The Netherlands and Norway. The main aim of the thesis is to increase knowledge, insights and understanding of trade of biomass, and how is it developing, in order to facilitate the growth of biomass markets globally and locally. The thesis focuses on the status of biomass trade for energy in the global and local EU-Russia context. Within in the local EU-Russia context it is possible to show the international biomass trade streams in details. Europe is currently the major player in global biomass trade and Russia is one of the leading exporters of wood pellets to the EU. Wood pellets are the main traded solid biofuel, thus its market can be studied in more detail. The thesis presents a global overview of trade in solid and liquid biofuels, particularly wood pellets, biodiesel, and bio-ethanol, and biomass products such as industrial roundwood. The thesis presents the main production, export and import volumes of studied products as well as global trade streams including potential developments of emerging trade streams such as torrefied biomass. In addition, the thesis describes the role of bioenergy in renewable energy development in the EU, and in the local context, wood pellet markets in Finland and Russia. The findings presented in the thesis are the outcome of seven articles presented in the second part of the work. The thesis comprises an introduction providing the background to the research questions, followed by individual papers considering various aspects of biomass in renewable energy, the wood pellet business, and the global trade in biomass. The findings from the work indicate that due to the variety of available biomass resources and continuing supportive policy and regulation in many countries, biomass trade will continue to be an important aspect of renewable energy markets for the foreseeable future. Despite slow progress in bioenergy development encountered in several EU countries, currently the EU remains a leader in biomass utilization and trade. Based on the example of the Finnish and Russian markets, it is evident that wood pellet markets vary considerably in different countries and have different orientations. Thus, the study concludes that fertile ground exists for further development of international trade in biomass for energy production. Download|This study aims to explore and analyze which barriers to commercialization can be successfully overcome by biorefineries, and which may require support from additional actors within the system, such as policy makers. The study found that when building a biorefinery business, it is crucial to decide the kind of strategy and corresponding business model to implement. Careful attention needs to be paid to the ability to mobilize biomass resources and to establish supply and demand structures at the same time. A collaborative approach, leveraging resources and building a web of favorable system components, has proven a viable strategic approach towards developing and commercializing biorefineries. Socio-economic assessment of forestry production for a developing pellet sector: The case of Santa Catarina in Brazil. Download | In Brazil, the forestry sector grew strongly due to a very low starting point and shows positive results in its development, which could be explained by the close relationship between the forestry industry and the local communities. Selected criteria, index and indicators were applied in a selected region in Santa Catarina, Brazil. The secondary data was gathered from industry and government sources and combined with primary data gathered from in-depth interviews and visits to the region. In Santa Catarina there is availability of resources from the forestry production but the pellet production sector is yet incipient and mainly for regional use. Santa Catarina represents 8.5% of the country’s total planted forests, having 82% of that area covered with pine. Wood production mainly supplies the pulp and paper industry, as well as the timber industry. More specifically, the area studied in this report (Lages) represents 60% of the wood production in the state. Download | This short paper summary highlights the findings of an extensive quantitative wood pellet market analysis based on trade flow data, price developments over time, exchange rate fluctuations and temperature data. Its focus lies on the main European small-scale heating countries Italy, Germany, Sweden, France and Austria in the time period January 2012 until December 2015. Market parties have been consulted to get anecdotal evidence and expert opinions to help interpret the results. The summary describes and analyses (1) the current market status with regards to internationally traded volumes of wood pellets and potentially underlying drivers as well as (2) the general state of the market for wood pellets for small-scale heating regarding international market integration and other market characteristics. Its aim is to discern key market drivers, especially when it comes to interactions between national markets. Conclusions with regards to data availability, research gaps, detectable trade patterns and wood pellets commoditisation process limitations are outlined. A webinar for interested researchers, market actors and policy makers will be scheduled for the early 2017. Purchase | This book reviews the bioenergy sector and draw useful lessons for the full deployment of the bioeconomy. 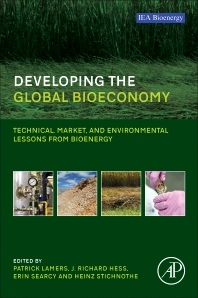 As expectations that a future bioeconomy will rely on a series of tradable commodities, this book provides a central accounting of the state of the discussion in a multidisciplinary approach that is ideal for research and academic experts, and analysts in all areas of the bioenergy, biofuels, and bioeconomy sectors, as well as those interested in energy policy and economics. 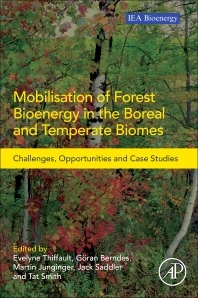 Purchase | The book features input from key international experts who identify and analyze the main opportunities and roadblocks for the implementation of sustainable forest biomass supply chains in the boreal and temperate regions. . It also proposes recommendations for practitioners, policymakers, and future research in the field of bioenergy conversion and management, as well as those interested in sustainable management of natural resources. Download | Cascade use or “cascading” of woody biomass is increasingly being discussed as a key principle upon which to base efficient utilization of wood, especially in the European Union (EU). Cascading does not have one universal definition, although a common theme is that “material use of wood should be prioritized over energy use of wood”, which forms the basis for our analysis herein. This working paper aims to inform the debate on cascading through an analysis of the terminology around cascading, and a review of how the concept is framed and implemented in policies of the EU and selected member states. It also discussed potential implications on international bioenergy markets from implementation of the cascading principle. The presentation of this study can also be found here. Download | Low-cost preconditioning technologies of raw biomass that can convert and modify different sources of solid biomass into a specification-driven bioenergy feedstock with similar or even better characteristics as coal could greatly enhance trade and usage of biomass in the existing transportation and conversion infrastructure. A mild pyrolysis process called torrefaction stands out as a very promising technological option, attracting significant interest and financial resources for further technological development and commercialization. Torrefaction is these days on the verge of commercialisation. Beside a sheer volume of scientific studies, engineering initiatives not only a number of demonstration plants but now also first commercial plants are in operation respectively construction. The torrefaction technology seems to have left the valley of death behind, not without losses only in the adventurers but even in respectable companies and investors, and the current development leaves little doubt that this technology will find its way into the biomass-to-energy value chain in the next years. This study focuses on the possible effects torrefaction may have on future international biomass trade. Download | The report first provides a brief overview of development of policy and criteria related to sustainability of bioenergy in the EU and in key biomass importer Member States (United Kingdom, the Netherlands and Belgium). The following sections then provide an thorough review of policy, regulations and practices of Canada and the United States, with a special focus of key biomass producing provinces/states (British Columbia, Ontario and Quebec in Canada, Georgia, New York and Massachusetts and California in the US); this in-depth analysis of the Canadian and American contexts was made possible due to the abundance of information available for those countries, but was also found necessary due to the scarcity of syntheses on this information. The next section then provides an overview of the policy and practices for land and forest management in Russia, with a focus on the region of Northwest Russia, based on the information that was possible to gather from this area. The report concludes with a discussion and main conclusions stemming from the analysis of the case studies. Download | A new report, “Biomethane: Status and Factors Affecting Market Development and Trade”, published in September 2014, was prepared jointly by Task 40 and Task 37 to address the status and emerging challenges of dealing with the rapid growth of production of biomethane, by either anaerobic digestion or thermal gasification, the developing biomethane market and trade of the gaseous biofuel. The aim of this study is to provide an up-to-date overview of the status of biomethane (including upgraded biogas and bio-SNG) production, grid injection and use in different countries, and to illustrate the options and needs for the development of larger biomethane supply strategies. The focus is on technical, economic and management- related hurdles to inject biomethane into the natural gas grid and to trade it transnationally. The study provides insights into the current status of technologies, technical requirements and sustainability indicators as well as cost of biomethane production and use in general and especially in selected countries. It also assesses implementation strategies, market situations and market expectations in selected countries, and proposes actions to be taken to reduce barriers and to develop the market step-by-step. With current discussions on indirect effects of biofuels, and the aim to broaden feedstocks to non-food biomass, policies are trying to put focus on biofuels from waste, residues and lignocellulose materials, so called ‘advanced’ biofuels. Next to the general biofuel incentives, these biofuels are getting extra support through specific promotion mechanisms. Examples are the double-counting mechanism for advanced biofuels in the EU, and the specific targets for advanced biofuels in the US. In this study, some typical cases are presented where promotion mechanisms for advanced biofuels have had an impact on markets and trade (used cooking oils and animal fats, sugarcane ethanol), or may be anticipated to impact markets and trade in the future (straw, wood pellets). General conclusions and summaries of the four case studies can be found in a summary report. Download summary. 2. Sugarcane ethanol: impact of the subtargets for specific advanced biofuels in the US Renewable Fuels Standard (RFS2), where sugar cane ethanol is classified as ‘advanced biofuel’. This has had a clear impact on prices and trade patterns between Brazil and the US. Download report. 3. Crop residues (straw) for bioenergy: straw may play an important role for advanced biofuels in the future. In countries such as Germany, Denmark or Poland, this is an emerging feedstock for energy and biofuels. There are already some experiences we can take into account from the promotion of straw for stationary energy, e.g. in Denmark. Download report. 4. International trade of US wood pellets for bioenergy in the EU: Renewable Energy promotion in certain EU Member States is causing considerable trade flows from the US to the EU. There is clear that there are interactions with existing wood markets and forestry practises. In the future there may be additional effects when demand for cellulose-based biofuels enters these markets. Download report. Download | The Savannah workshop was a unique opportunity to bring together a broad spectrum of stakeholders to evaluate sustainability issues – particularly biomass sourcing options – at a critical moment in the development of the global wood pellet trade. A key objective was to increase the collective understanding of sustainable procurement options already in use in the South and how these systems match up to European demand. Connections among participants were strengthened for future cooperation in hopes of establishing meaningful sustainability criteria. These connections are key to informing ongoing processes such as the deliberations of the Sustainable Biomass Partnership and governmental bodies throughout Europe and North America. Download | NL Agency commissioned Utrecht University’s Copernicus Institute, leader of the IEA Bioenergy Task 40 workgroup on biomass trade, to perform the analyses for this year’s annual report on Dutch biomass trade. The detailed report reviews the entire biomass arena as perceived from the Dutch context. Distinguishing between wood-based biomass flows, oils and fats and carbohydrates, and with much attention paid to the current push towards certification, the report is a must-read for all those involved in the biomass arena at the strategic level. The editors also provide an extensive framework for the monitoring and providing guidance to the growing biomass industry. EU in the spotlight: New in this edition is an attempt at a comparative review of global imports and exports for ten leading commodities – with an emphasis on comparative data concerning the EU. The report shows that the EU continues to be a champion of biofuels and biomass imports, surpassing the US in imports of biodiesel and wood pellets. Link the news. Download | The objective of the study is to obtain a global overview of the biomass use in industrial and transport sectors and to compose lists of the largest users of energy biomass in the world. Various statistics, databases, reports, and reviews, most of them publicly available, have been utilised during the study to examine plants that either refine biomass for use in transportation and heating purposes or plants that convert biomass into heat and power. The plant lists presented are based on the prevailing situation in the end of the year 2012; due to lack of comprehensive and accurate plant-specific information and rapidly changing situation, the results should be used with care. – Summarize the range of results into 3-5 storylines of future international bioenergy trade. Download | This report focuses on long-distance biomass supply chains, including ground-based supply of raw biomass to densification plants, and transportation of densified biomass to ports in other continents. It aims to: (i) provide an overview of the characteristics of three densified biomass forms; solid wood pellets, solid torrefied wood and liquid pyrolysis oil; for these; (ii) outline existing and future markets and specific supply chains for these products and explore large sources of biomass worldwide, some well-established and already being developed either for local use or trade, some only identified as a possible future potential source; (iii) highlight the importance of the costs of logistics in biomass supply chains; (iv) illustrate current cost structures of existing long-distance biomass supply chains, and (v) explore how the cost of current and future long-distance supply chains of wood pellets, torrefied pellets and pyrolysis oil could be lowered, and what this would require form the stakeholders involved. This publication reports on the discussions and opinions expressed during an expert workshop on the environmental sustainability of forest bioenergy in Canada, held in Quebec on the 3-5 October 2012. The workshop was organised by the International Energy Agency Bioenergy Task 40 (International Sustainable Bioenergy Trade) and Task 43 (Biomass Feedstocks for Energy Markets), the IEA Bioenergy Executive Committee, the Faculty of Forestry, Geomatics and Geography of Laval University (Quebec, Canada), and Natural Resources Canada, with collaboration from the Global Bioenergy Partnership and the Canadian Council of Forest Ministers. Participants engaged in dialogue critical for the formulation of rational policy to achieve sustainable forest bioenergy production systems. The trade of global bioenergy commodities, such as ethanol, biodiesel and wood pellets has been growing exponentially in the past decade, and have by 2013 reached true “commodity” volumes, i.e. tens of millions of tonnes traded each year, and billions (both in US$/EUR) of annual turnover. IEA Bioenergy Task 40 was founded in 2004 and is now in its 4th triennium. For the past 9 years, task 40 has monitored the developments in international bioenergy trade, including the organization of about 20 workshops on trade-related topics, and the publication of over 100 studies, country reports, newsletters, etc. The amount of material produced over the years and insights gained in how biomass markets and international trade of biomass and biofuels has developed is impressive. Besides that the group has produced overviews and insights, also a large amount of practical experience has been brought together in what works and what doesn’t. Last but not least, based on all this, there are clear(er) views on how to proceed to build working sustainable international biomass markets in the future. This book compiles those lessons and insights into an easily accessible book publication. More information on the book available at Springer website. At present numerous biomass and biofuel sustainability certification schemes are being developed or implemented by a variety of private and public organisations. This induces multiple challenges, e.g. confusion among actors involved, fear of market distortion and trade barriers, an increase of commodity costs, questions on the adequacy of systems in place and uncertainty over how to develop systems that are effective and yet cost-efficient. To support sustainable bioenergy deployment and overcome some of the challenges mentioned above, this IEA Bioenergy strategic study examined what is actually known and what can be learned from the current development and implementation of voluntary certification systems, about the role of voluntary certification schemes in the governance of biomass/bioenergy/biofuels sustainability and how this has affected actors along the supply chains and trade. Download short summary. Download | 14 November 2012 – The focus of this study is to examine briefly the status of the development of torrefaction technology, and more importantly assess what are the likely biomass sources and what impact the development of torrefied wood will have on global trade, in particular between now and 2020. This study assessed the extent torrefaction might open up new biomass feedstock sources, and explored how torrefied biomass will perform along the logistical chain of long-haul international transport and at the end-use conversion plants. The torrefaction process was compared with two other important preconditioning technologies: simple pelletization and flash pyrolysis. Another report by Task 32, “Status overview of torrefaction technologies“, presents an overview of the current status of torrefaction technologies and their market perspectives. Download | 11 August 2012 – This report is an overview, not a detailed analysis, of the use of biofuels in commercial aviation. Aviation is a global industry with global problems and challenges that also demands global solutions. Key objectives of commercial aviation are to find reliable fuel alternatives to cut costs, and reduce volatility of fuel supply, GHG and improve logistics. The use of biofuels in commercial aviation has received considerable attention in recent years, as it is currently one of the best short to medium term alternatives. Commercial aviation is predicted to grow at a 5% rate annually until 2030, exceeding expected fuel efficiency improvements of approximately 3%; this implies that fuel consumption and emissions will continue to rise. According to IATA (2011b) the airline industry will progress from carrying 2.4 billion passengers in 2010 to an estimated 16 billion passengers in 2050. The global fleet now numbers 100,000 and there are eight major aircraft manufacturers. This is an industry that requires huge investment but provides low returns. See report for more details. Download | 8 June 2012 – This report has been commissioned to identify and present global data on wood chip trade, to analyze the underlying trade patterns, and to conclude upon their interactions with bioenergy policies. At the centre of the analysis is direct trade of wood chips for modern bioenergy use in markets where respective policies are in place. Whereas associated trade flows where the initial reason is not directly related to energy usage, e.g., wood chips for pulp and paper of which a fraction ends up as black liquor and is used for energy (see ref  in the report for a distinction in the case of Finland) are outlined to put the energy related trade into perspective, but not investigated in detail. Download | 9 February 2012 – The thesis explores global and national-level issues related to the development of markets for biomass for energy. The thesis consists of five separate papers and provides insights on selected issues. The aim of Paper I was to identify methodological and statistical challenges in assessing international solid and liquid biofuels trade and provide an overview of the Finnish situation with respect to the status of international solid and liquid biofuels trade. The purpose of Paper II was to provide a quantified insight into Finnish prospects for meeting the national 2020 renewable energy targets and concurrently becoming a largescale producer of forest-biomass-based second-generation biofuels for feeding increasing demand in European markets. Paper III summarises the global status of international solid and liquid biofuels trade as illuminated by several separate sources. The objective of Paper V was to clarify the alternative scenarios for the international biomass market until 2020 and identify the underlying steps needed toward a wellfunctioning and sustainable market for biomass for energy purposes. Download | December 2011 – The wood pellet market has experienced a large growth in the last five years (2006-2011). In 2006 the production of wood pellets was estimated between 6 and 7 million tonsworldwide (not including Asia, Latin America and Australia), drawn from a previous Task 40 pellet market study published in 2007. In 2010 the global wood pellet production reached 14.3 million tons, including the above mentioned countries, while the consumption was close to 13.5 million tons thus recording an increase of more than 110% if compared to 2006. This report presents the wood pellet industry and market in Europe and North America. It also includes perspectives of domestic use and trade of wood pellets in emerging markets (Asia and Latin America) and the challenges to ensure a sustainable pellet trade.A shortened version of this report has been published by BioFPR: C.S. Goh, M. Cocchi, M. Junginger, D. Marchal, D. Thran, C. Hennig, J. Henimo, L. Nikolaisen, P.P. Schouwenberg, D. Bradley, R. Hess, J. Jacobson, L. Ovard, M. Deutmeyer (2013) Wood pellet market and trade: A global perspective. Biofuels, Bioproducts, and Biorefining. 7(1), p.24-42. Download | November 2011 – This report presents the results of an effort for IEA Bioenergy Task 40 to develop a modelling tool for international biomass trade. Part of this work has also been done in the frame of the RE-Shaping project, and parts of the methodology and the results have also been published as a RE-Shaping deliverable (Hoefnagels, Junginger et al. 2011). In addition, the scenarios for International solid biomass imports were originally developed for the European Commission (Junginger, 2011). The main aim of this report is to illustrate the approach to include logistic cost of biomass in an energy model and implications to supply and demand of biomass for bioenergy. The costs, as presented in this report, are not intended to and do not always reflect actual (fluctuating) prices of feedstocks, pre-processing and transport of bulk freight. Download | April 2011 – Based on the experiences in the Task 40 member countries, this report [252 KB] shows how bioenergy trade has developed during the past 6 years in the member countries, and how it has contributed to increasing bioenergy production and utilisation. Between 2004 and 2007, the absolute amount and share of bioenergy in the total primary energy supply has increased in all countries except for Canada, the US and Norway. In some countries, the increase has been substantial, e.g. doubling in Belgium and Germany. International bioenergy trade has played an important role in this increase: summed up over all Task 40 countries, the total trade volume of both imports and exports has increased by about a factor of 2 between 2004 and 2007. The increase was mainly due to a strongly rising trade in liquid biofuels (164% increase in total imports, 172% increase in exports), while the trade in solid biomass increased more moderately but still significantly (51% and 16%). More details, including policy and market drivers and concise descriptions of the developments in each member country are also included in the report. Download | May 2010 – The aim of this report is to provide up-to-date overview of what market actors currently perceive as major opportunities and barriers for the current and future development of international bioenergy trade. The work focuses on three internationally traded bioenergy commodities: bioethanol, biodiesel and wood pellets. Data was collected through an internet-based questionnaire, which was completed by 141 respondents. Results show that import tariffs and sustainability criteria are perceived as major barriers for the trade of bioethanol (and to a lesser extend of biodiesel), while logistics are seen as an obstacle mainly for wood pellets. Development of technical standards was deemed more as an opportunity than as a barrier for all three commodities. Phytosanitary measures were not an issue for any of the investigated commodities, but may prevent the trade of other (mainly solid and unrefined) biomass, such as wood chips. Most important drivers were high fossil fuel prices and climate change mitigation policies. Concluding, some barriers for bioenergy trader are commodity specific, and will need specific actions to overcome. As a first step, import tariffs for biofuels could be reduced or abolished, linked to multi-national trade agreements and harmonization (including provisions on technical standards and sustainability requirements) which might provide the necessary preconditions for further sustained growth of international bioenergy trade. A shortened version of this report has been published by Energy Policy. This background report contains additional information, including the original survey and all answers provided by the respondents. Preferably, please use the following reference for citation: Junginger, M., van Dam, J., Marchal, D., Faaij, A., Zarrilli, S., Ali Mohamed, F., (2011) Barriers and opportunities for global bioenergy trade, Energy Policy 39 (2011) 2028-2042, doi:10.1016/j.enpol.2011.01.040. Download April 2010 – The report includes an extensive overview and update on relevant certification initiatives and systems for biomass and bioenergy certification, based on the year of 2009. Examples of included initiatives are the roundtable initiatives (RSB, RTRS, BSI, etc), forestry standards (FSC, PEFC), agricultural standards (SAN, GlobalGAP) and specific voluntary standards for bioenergy (ISCC, NTA8080). Every initiative gives a description of the context, status and organization structure. This is followed by a description of its principles, criteria and indicators. The report is the background document from the paper Dam et al (2010), From the global efforts on certification of bioenergy towards an integrated approach based on sustainable land use planning (submitted to the Journal of Renewable and Sustainable Energy Reviews). This article provides a comparison between the systems, followed by an overview of current bottlenecks, and required activities, to come to a harmonized, efficient system to guarantee the sustainability of biomass and bioenergy. Download | 18 April 2010 – Investing in bioenergy (and especially in bioenergytrade) is not generally well understood in the investment community. The objective of this study was to explore the possibility for the creation of a Bio-trade Equity Fund. Such a fund could be to invest in projects that promote world trade in biomass while yielding a rate of return commensurate with risk. Projects could include: improving ground-based biomass feedstock supply systems, such as advanced chipping systems and inland ships; building biomass conversion plants, such as for pellets, BioOil, 2nd generation ethanol and torrefied wood; and enhancing bio-product transportation systems, such as port improvements, purpose built loaders, and specialized biofuel ships. The study concludes that such a fund could be feasible, and outlines a possible business plan, including the setup of the fund, a time schedule and example projects a fund could invest in. It is anticipated that such a fund could result in meaningful volumes of biomass transported where they are needed most in the next 10 years to achieve renewable fuel targets. It in turn would result in the creation of jobs in developing nations, commercialization of new technologies, and ultimately reduction in worldwide GHG emissions. In case you would like to receive more information, please contact the main author of the study, Doug Bradley.